"I've always wanted to debate important ideas." The Orchard has released the first official trailer for a compelling new intellectual debate documentary titled Islam and the Future of Tolerance, which will be released on VOD platforms in December for those who may be curious. In a world riven by violence and misunderstanding, prominent atheist author Sam Harris and Islamist-extremist-turned-liberal Muslim Maajid Nawaz seek to provide a remedy to the polarizing rhetoric and obscurantism around the topic of Islam. It's a debate film, but it's more than that, an attempt to reconcile differences through conversation and discussion. To examine in more detail what's going on, along with different interpretations, and what's actually written in the Quran. What fascinates me the most is that the two intellectuals have been in heated debates before, and seem to mortal enemies, yet they put that behind them and came together to make this. 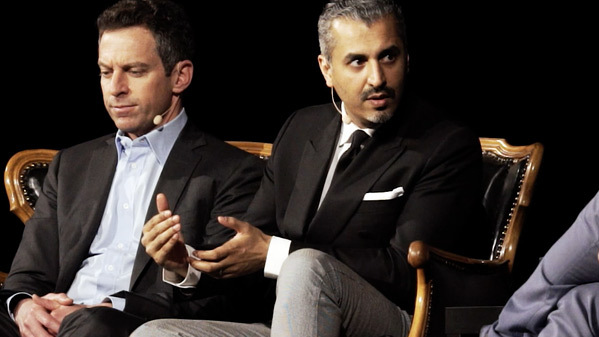 After publicly clashing in a debate over the concept of Islamic reform in the Muslim world, prominent atheist philosopher Sam Harris and Islamist-turned-liberal-Muslim Maajid Nawaz reconnect several years later in an attempt at civil and honest dialogue. Sam and Maajid explore their real or imagined divides by clearly and rationally dissecting their disagreements. Through the course of their discussions, they tackle troubling passages from the Quran, the importance of the precision of language and terms (such as “Jihadism,” “Islamists,” and “radical,”) and the difficulty in finding helpful and honest responses in a fraught political terrain. Ultimately, this unlikely collaboration sheds light on the many confusions that afflict the public conversation about Islam and emphasizes how the virtues of open dialogue can help foster both understanding and tolerance in an increasingly polarized world. Islam and the Future of Tolerance Poster is co-directed by filmmakers Desh Amila (directorial debut) & Jay Shapiro (Opposite Field). The Orchard will release the doc direct-to-VOD starting December 11th this fall. Who's interested?